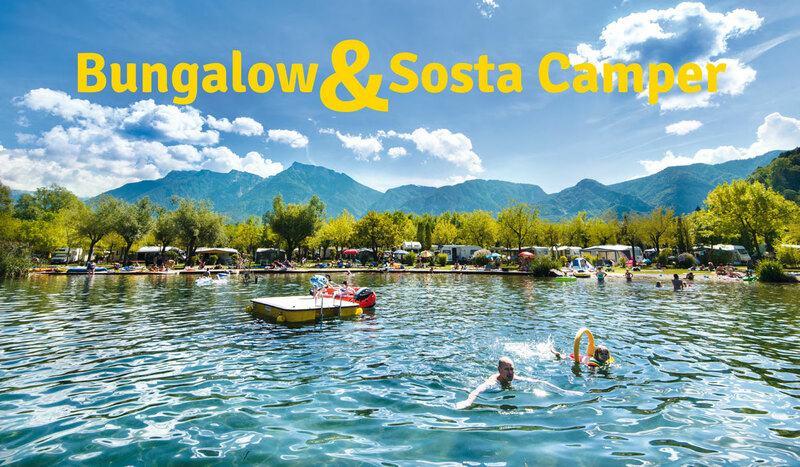 Lago di Levico Camping, the ideal place for a holiday dedicated to relax and sport in the middle of the nature. Large private beach on the lake available, 3 new pools, wood chalet and large areas for campers with private toilets. Four star village, opposite the bycicle path of Valsugana, 1 km from the thermal baths. Ideal point of departure for trips or excursions. It offers campsites from 24€ including access for 2 people, mobile house from 40€ including access for 2 people, areas for campers from 15 €. We are looking forward to the opportunity to have you as our guest at Levico Terme, a historical, year round attraction located in the Valsugana. This healthful area is characterized by majestic mountain ranges and by the richness of its waters: a regenerative and healing mountain spring water as well as the beautiful Lake Levico, nestled in the greenery of this relaxing and varied corner of Trentino, at the foot of the Dolomites. Located on the bank of the lake and surrounded by a 20.000 square metres private park, it is provided with sport tools and covered car park. It is the only hotel on the lake with wellness centre annexed. Our philosophy: wellness and respect for the environment. Gastronomy, thermal baths, sport, culture, family, relax. It’s the perfect place to spend your holidays with your children. At the lake, in the mountains among the typical alpin buildings, walking around with the horses or in granpa Sergio’s vegetable garden. Parc Hotel Du Lac has a spa, an indoor and an outdoor swimming pool and a private beach. It is the ideal place to enjoy an holiday in Levico Terme in the sign of wellbeing and relax, dipped in the pure nature. In the Cristallo Hotel you will find the right ingredients for a perfect holiday: the ancient traditions of hospitality, and the answer to diversified demands (relax and sport), but also an environment typified by the Alps, wild woods and little lakes. Located in the centre of Levico, opposite the thermal baths, it is provided with rooms with air conditioning and panoramic balcony. The owner takes care of the cousine with particular attention to the local and seasonal products. Elegant and welcoming atmosphere, located in the best position within the area of the lake. It offers pool, hydromassage and sauna. Large car park and free garage, 1.800 square metres garden, toys for children. 200 metres from the Lake of Levico, Hotel Bavaria offers quiet, relax and a great cousine to its guests. The hotel has an outdoor pool surrounded by the nature, bar, tv room and free wifi connection in the common areas. The hotel has 49 rooms, large dining room and tv room, bar, lift, garden, outdoor pool with hydromassage that also permits to swim upstream, wellness centre, garage, mountain bike rental. Animals accepted on demand. Located in the centre of the town of Levico, opposite the thermal baths, it is provided with living room with tv, large dining room, bar, terrace, lift, garden and car park. Comfortable rooms with private toilet facilities, telephone, strongbox. Homely atmosphere, sunny and quiet position, close to the park and the rail station, confortable and bright wood rooms. The ideal place for a relaxing holiday. Solar and photovoltaic panels and home automation for the respect of the environment, wi-fi, car park, mountain bikes and garden. The charme of a hotel that dates back to 1892, with an offer of culinary delights based on the tastes of Trentino and a rich wine selection. Wellness centre with indoor pool, sauna and beauty centre. Hotel Florida is placed on the banks of the lake, in a heaven of peace where the guests will be able to practice various activities for a pleasant, relaxing holiday surrounded by nature and professionalism. Close to the thermal baths, surrounded by the nature, peaceful, with garden and private car park. Rooms with panoramic view and wi-fi. Offers for motorcyclists and cyclists. Mountain bikes available for free. Animation in the evening. Hotel Liberty, just 20 metres from the thermal baths, offers an intimate and sophisticated atmosphere to make your holiday an authentic break. In tune with the thermal holiday, a natural and balanced cousine. Lucia Hotel is located in the centre of Levico Terme, unique with open-air swimming-pool, garden and panoramic view of the mountains of Valsugana. Close to the Levico Spa, it is the ideal location to have a relaxing and reinvigorating holiday. Historical house in the centre of the town, renovated in 2011. Large oak rooms, mosaic bathrooms. Contemporary style and attention to details and historical materials contribute to create a very warm atmosphere. Just a few metres from one of the cleanest and most suggestive lakes in Italy, the hotel is surrounded by a very well maintained park. It has 31 rooms, all provided with private toilet facilities, satellite tv, telephone, lift. It has just been renovated. In a quiet location close to the park of the House of Habsburg, it is equipped with large car park, garage for motorbikes and bikes and pool placed in the surrounding park. New wellness centre opened in 2012. Placed In the centre of the town, on the main street, it is the only hotel with access for the guests within the pedestrian zone. Close to the thermal baths, it has comfortable rooms, some of which with air-conditioning, and nonallergic parquet floor.